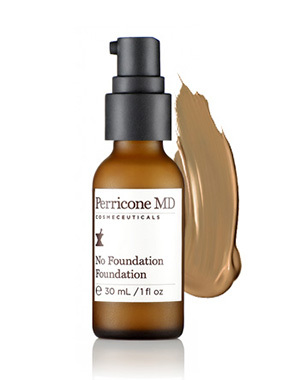 Perricone MD No Foundation foundation – The first advanced anti-aging, multi-tasking translucent foundation with non-chemical SPF 30 protection. With Alpha Lipoic Acid, DMAE, and Vitamin C Ester. As a dermatologist to some of the most famous faces in the world, their special needs often become inspiration for the creation of new products. When more than one celebrity make-up artist asked Dr. Perricone for a type of foundation that would let the skin’s natural radiance and beauty shine through, No Foundation Foundation was born. Created to keep skin looking dewy and flawless, this unique formula delivers many benefits of a traditional foundation without the heavy matte finish, which emphasizes the tiniest skin imperfections. No Foundation Foundation is a multi-purpose product that provides natural translucent coverage, corrects skin undertones, instantly smoothes fine lines and boosts skin’s natural moisture throughout the day, all the while delivering antioxidant benefits.